Aargh! It’s a Pirate Party! 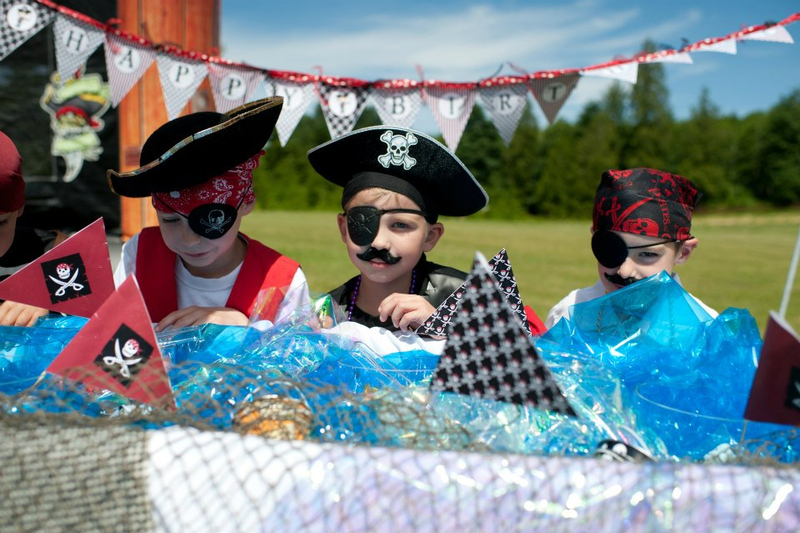 Boys and girls alike enjoy a good ol’ fashioned pirate party–especially one that is filled with swashbucklin’ fun activities, pirate costumes, treasure chest loot and delicious pirate booty. 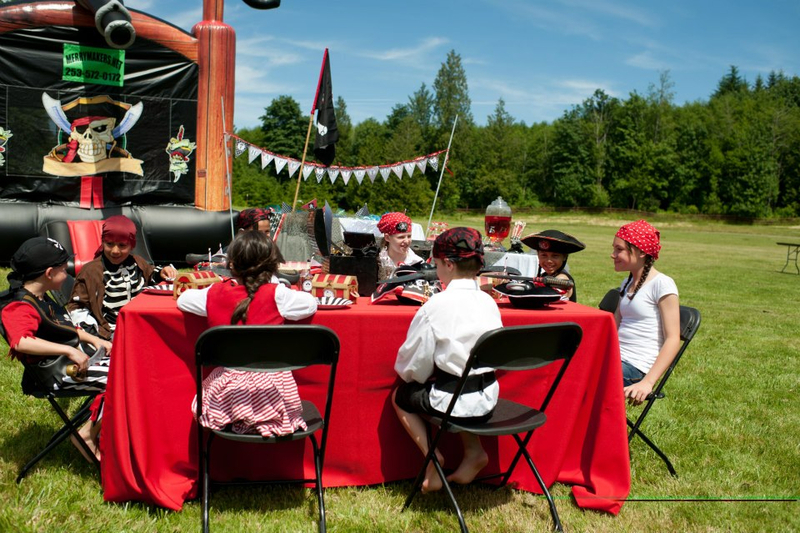 Pull out your telescope and peek at all of the scurvy details of this pirate party we had the opportunity to plan! 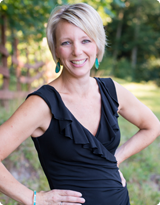 The photos by Simply Enjoy Photography may leave you shouting “Aargh”! Upon arrival, each guest was invited to grab some pirate garb and dress the part! 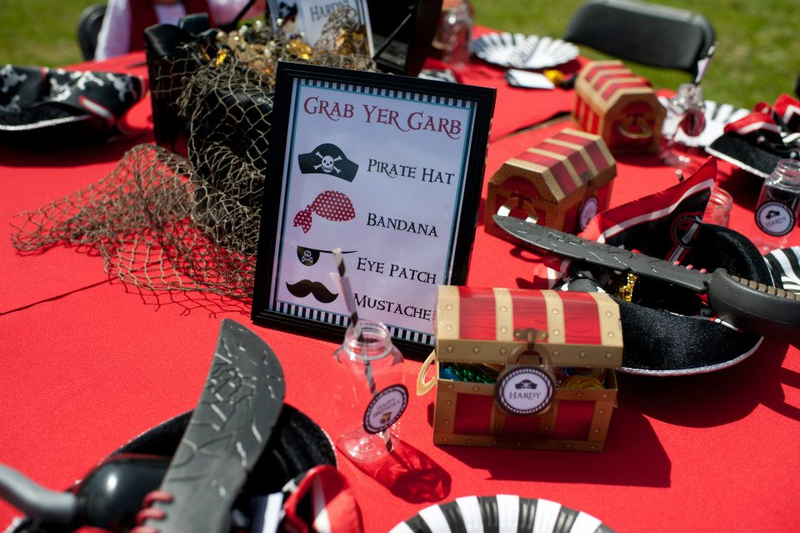 Each pint-sized pirate in the making could choose their own pirate garb which was fashionably displayed on the party table. 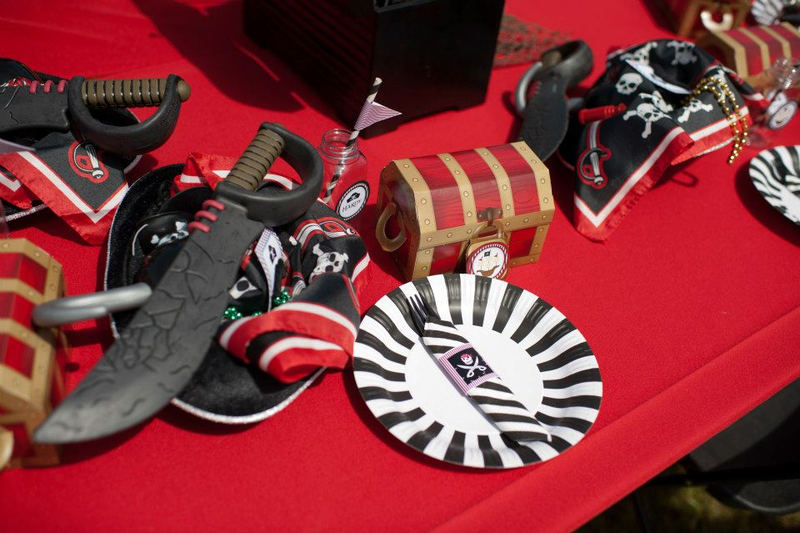 Items included bandannas, pirate hats, mustaches and eye patches, hooks & even swords. I adore the unique look each pirate created. 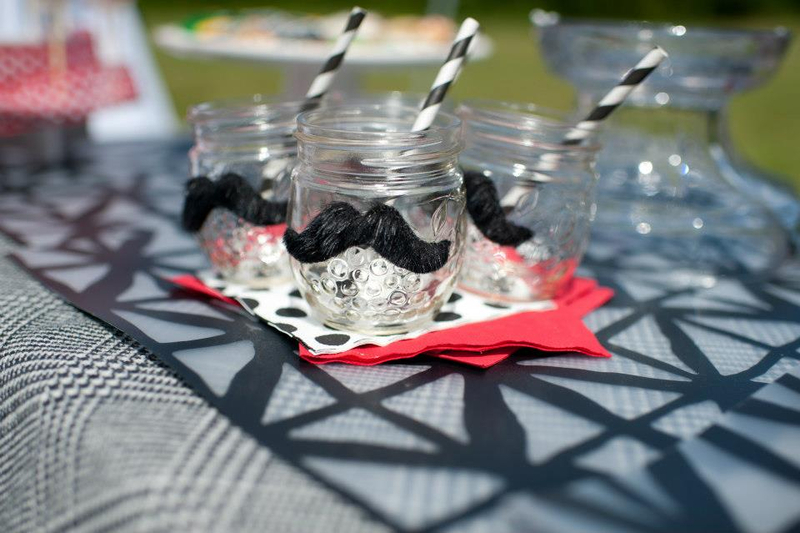 Guests loved getting into character, which set the course for an even more exciting birthday adventure. Once in character, these pirate scallywags could participate in a number of sea-faring activities. As previously pictured, they could test their skills by “walking the plank”. Engaging in play sword fights was another popular activity. Or, best of all, they could work off some of the extra energy by getting carried away in the pirate themed bounce house from Merry Makers! Pirate booty was plentiful on the treat table. How perfect are the delicious skull pretzel sticks from Pretzels Pleaze? Pirate cupcakes by Covered with Sprinkles and darling cake pops by Cakepops by Rachel certainly didn’t disappoint! 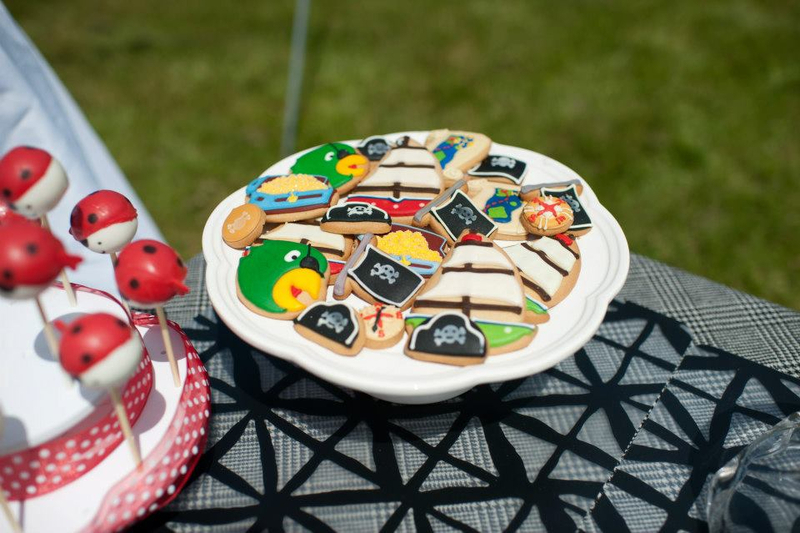 And if the aforementioned booty wasn’t enough edible treasure, fabulous pirate cookies by Eleni’s Cookies were prepared in awesome pirate inspired shapes–parrots, ships and of course….treasure! Drinks were cleverly displayed in a giant treasure chest, made more authentic looking with beaded necklaces and various loot strewn about. The adorable pirate labels were designed by Party So Perfect and gave the water bottles that perfect theme coordinating look. 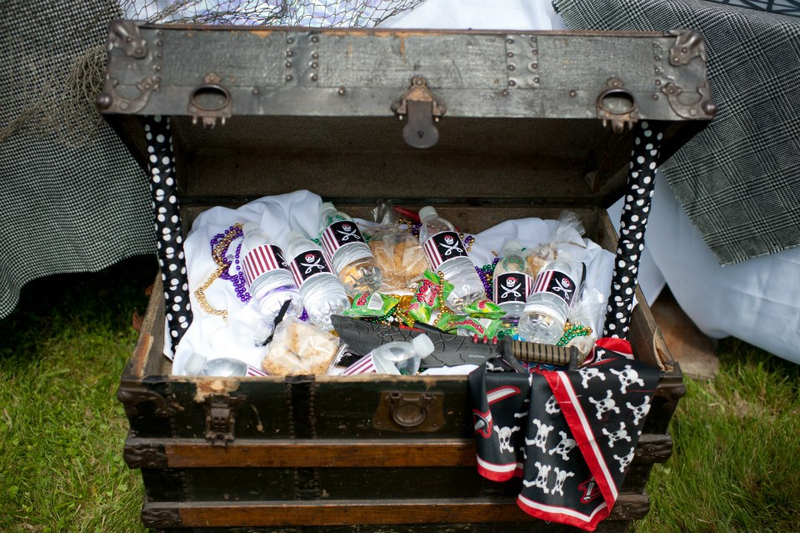 Hungry pirates could feast from a festive table, where there was plenty of “loot” for each child to take home. Swords, hooks, and of course their costume choices from earlier, plus a treasure chest full of gifts that doubled as place setting décor. The table was made more exciting by dressing it up with blue cellophane “water”, a printable pennant banner and cute milk bottles from Cute Kids Foodbox with striped straws from Sweets and Treats Boutique. 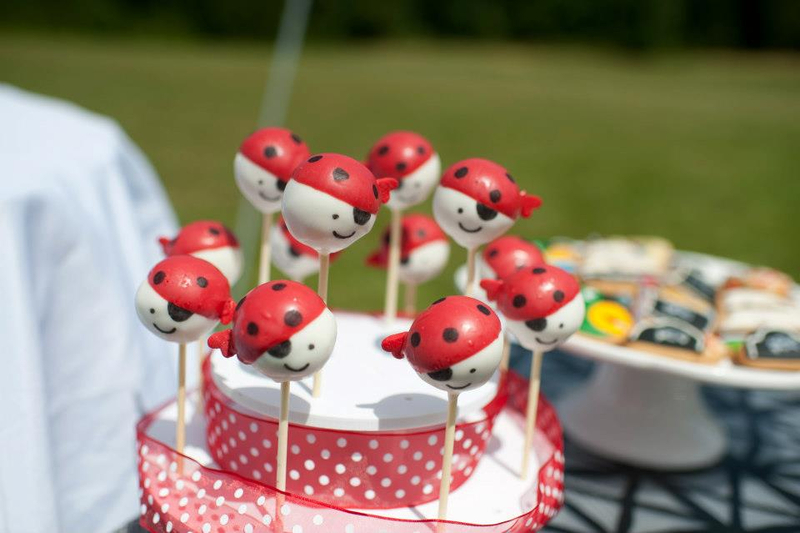 This birthday party was fantastic in an outdoor setting where the kids could frolic all they wanted. Many of the details and activities could easily be adapted for indoors too! 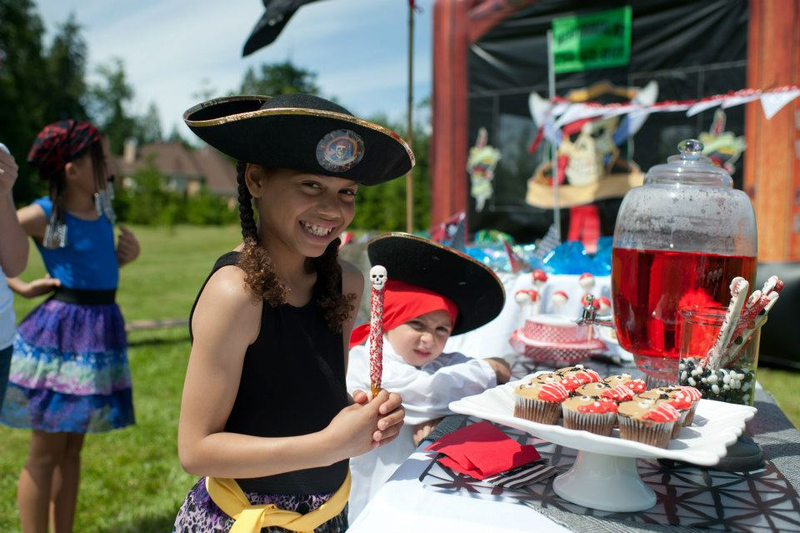 **View our pirate party gallery here. 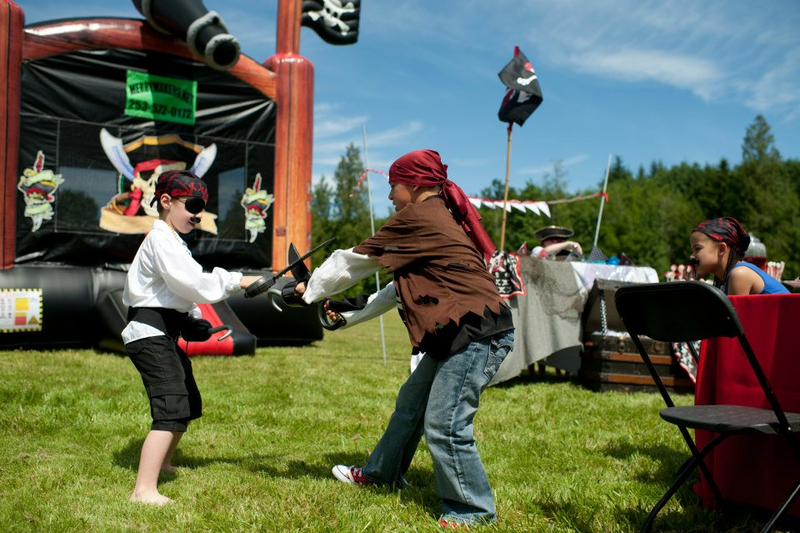 Planning your own pirate themed party? 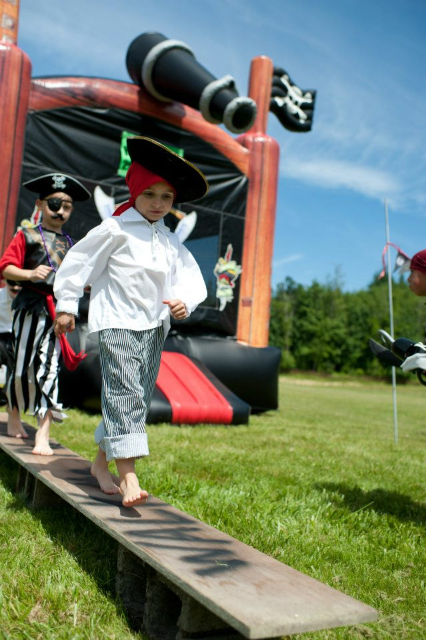 Check out these fun pirate party resources (or walk the plank)! 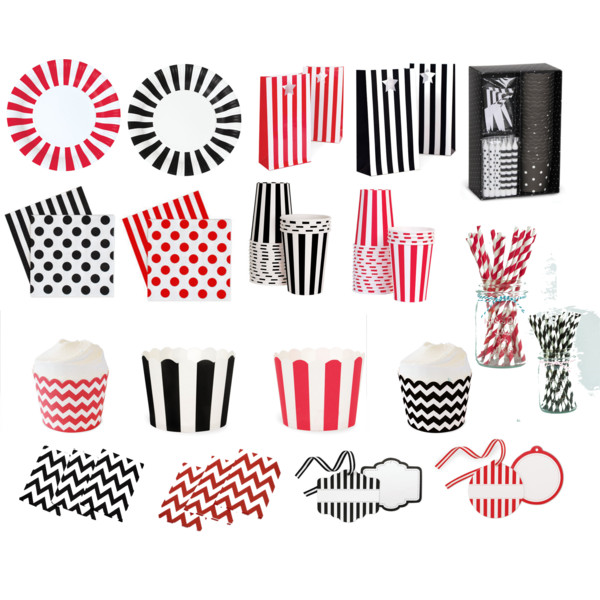 Shop pirate party supplies here. 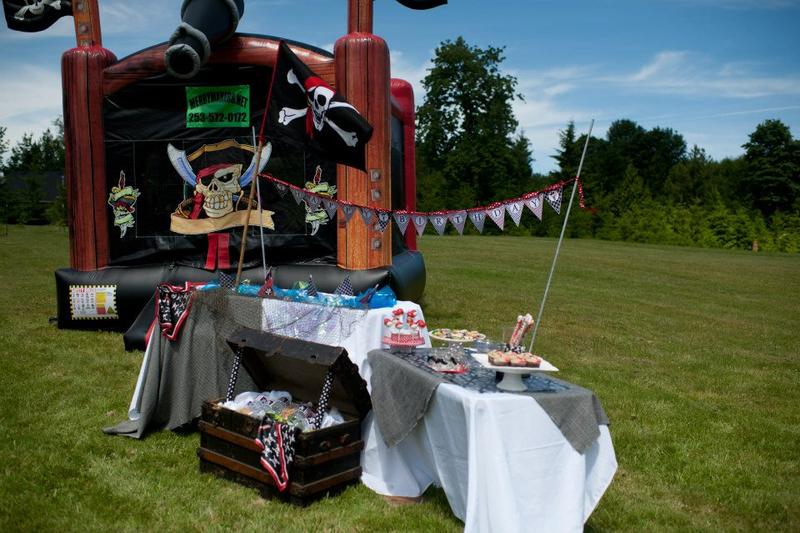 This entry was posted in General Site News and tagged birthday party, pirate party, treasure chest, walk the plank. Bookmark the permalink.